Oxygen. We take it for granted, don't we? Then suddenly it's all we can think about. Oxygen dependence can be a game-changer, but it doesn't have to be a life-changer. I've spent years learning about the latest in portable oxygen equipment. There are so many options, and I want to share them with you. I'm the Oxygen Gal, teacher of all things oxygen! The much-anticipated SeQual eQuinox has just received approval by the Federal Aviation Administration (FAA) for use onboard aircraft. This is good news for those who are anxious to travel as soon as the product becomes available. And just when will that be? Your wait is nearly over. The new SeQual eQuinox will be available to purchase April 1, 2014. The latest information I have received about the eQuinox is encouraging. 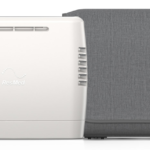 It will have the same oxygen output as the SeQual Eclipse, producing 3 LPM continuous flow and pulse flow up to Setting 6, as well as the extended flow settings up to 192 mL per breath. The unit has the same general shape as the Eclipse, but will be 33% smaller and weigh only 12.8 pounds. The new battery will make the eQuinox hard to beat. There will be two battery options: a 12-cell battery that will last 2.5 hours on 2 LPM continuous, and a 24-cell battery that will last nearly 5 hours on 2 LPM continuous. A 5-hour battery for continuous flow is unheard of and will be a welcome feature for many oxygen users. The unit will also have a front-loading battery compartment, which will provide much easier access, especially during air travel. Another welcome feature is the sound level. At 37 dBA, the eQuinox will be the quietest continuous flow concentrator on the market. Finally, for the visually impaired, the new talking display panel will assist with communicating flow settings and battery durations. It will even provide technical assistance. With these great features, you can expect to pay about $1400 more than you would for a SeQual Eclipse. OxiMedical appears to gearing up for the April 1st release. 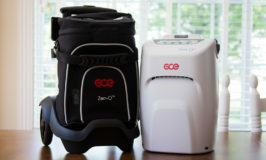 I'm the Oxygen Gal, teacher of all things oxygen, sharing news and information about home and portable oxygen concentrators. I am passionate about helping others learn about oxygen concentrators so they can make the best decisions for their respiratory needs. I’m 85 years old. Have used a SeQual poc for several years but it is too heavy for me to manage comfortably. Need both continuous & pulse as use I CPAP. Would love to try the new Equinox but can’t locate one. Any clue as to just when they will be on the market? From what I have heard, there were parts delays and then manufacturing took longer than expected. There seems to be hope that the unit will be available by the end of the month. allison, i hope you can help me, i’m just now going on oxygen for at night. we are planning a cruise for our anniversary( jan 31st) & i don’t know whether to go or cancel. i know there is a huge amount of walking just to go anywhere on these new ships. what would i need to get around and for sleeping? lin care in fl is my provider. eagerly awaiting your reply!! I would need to know what oxygen flow setting you are using to make a better recommendation, but the smallest and lightest POC that will provide a continuous flow setting for night use (up to 2 LPM) is the Respironics SimplyGo. 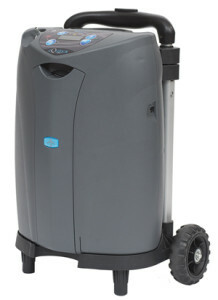 This is a 10-pound unit that includes a cart for walking around during the day. You would need to use the pulse flow settings during the day for longest battery life. If you need more than 2 LPM then you would need a larger unit like the SeQual Eclipse 5, which provides up 3 LPM. Hi Allison. I’ve been on oxygen a month. I have the invacare platinum 10 concentrator. I have to use it 24 hours a day. I’m at a level 8. In order to good out I have to use the tall tanks and at my level ,8 it lasts 35 to 45 minutes. Do you have any suggestions or am I doomed to have to not he able go out? If you are able to use a pulse flow, then the SeQual Eclipse 5 may work for you. It is really the only unit worth trying. It provides up to pulse setting 9 and the battery would last over an hour. Several batteries would be needed for longer outings. Get free and fresh content delivered to your email each time we publish. Your privacy and email address is safe with us!